About "A Child's First Lessons in Knowing God (On The Way Series)"
Customer Reviews For "A Child's First Lessons in Knowing God (On The Way Series)"
Lessons for 2 year olds! This book is so easy to use and is well-suited to the 2-3 year old Our church has used it for both Children's Church and Playgroup There are reinforcement ideas for parents to do at home as well as a leader preparation section Also included are a range of activities and crafts for each lesson which encompasses the different learning styles These use simple everyday materials or photocopiables An excellent resource! And it is cheap too! 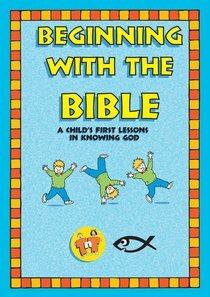 These lessons teach children that Bible stories are true. Everything you need to present the lessons is provided, including instructions for low-cost craft activities. Paperback.